78th District Court arraignments, posted April 13, 2018. – Ronald Dee Robbins, Jr., 56, of 98 E. Ferry St., Shelby, was arrested April 5 by the Shelby Police Department (SPD) for a felony of third-offense domestic violence. Preliminary conference: April 16 at 3 p.m. Bail: $25,000/10 percent. possession. Preliminary conference: April 23 at 3 p.m. Bail: $5,000/cash/surety/10 percent. – Patrick Michael Buchanan, 44, of 2552 S. 192nd Ave., Hesperia, was arrested April 4 by OCSO for a felony of malicious destruction of trees, shrubs, grass, turf, soil $1,000-$20,000. Preliminary conference: April 16 at 3 p.m. Bail: $5,000/cash/surety/10 percent. – Luis Angel Mendez, 23, of 3559 S. 132nd Ave., Hesperia; OCSO; selling/furnishing alcohol to a minor. Pretrial: April 17 at 4:15 p.m. Bail: $5,000/cash/surety/10 percent. – Jeffrey Wayne Shafer, 43, of 5823 N. 192nd Ave., Walkerville; OCSO; second-offense driving while license suspended (DWLS). Pretrial: April 10 at 4:45 p.m. Bail: $2,500/cash/surety/10 percent. 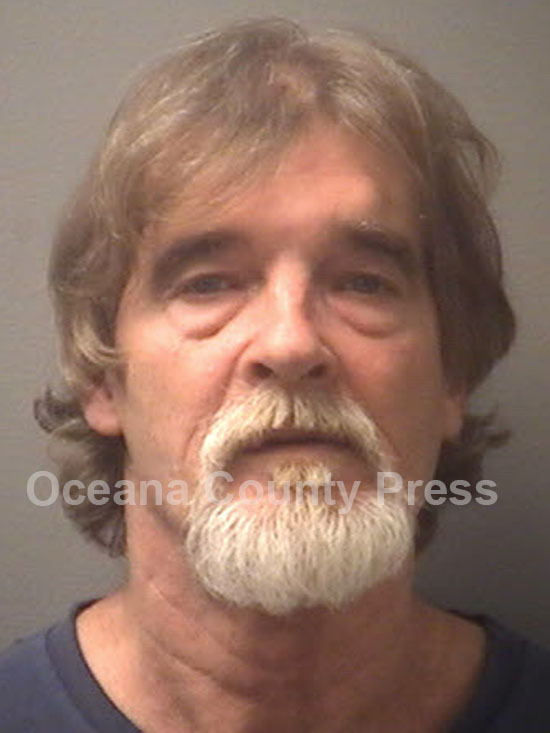 – Daniel James Kraus, 62, of 8110 13 Mile, Bitely; OCSO; improper plates. Pretrial: April 17 at 4 p.m. Bail: $1,500/personal. – Hunter Perry Buchanan, 21, of 950 Bowline Rd., Norton Shores; OCSO; attempted selling/furnishing alcohol to a minor. Pretrial: April 17 at 11:15 a.m. Bail: $2,000/cash/surety/10 percent. – David Michael Pearson, 45, of 6760 W. Deer Rd., Mears; OCSO; assault and battery. Pretrial: April 17 at 4:30 p.m. Bail: $2,500/cash/surety/10 percent. – Hunter Victor McDonald, 20, of 950 Bowline Rd., Muskegon; OCSO; operating without insurance. Pretrial: April 17 at 3:45 p.m. Bail: personal recognizance. – Renee Lynn Hansen, 58, of 5923 W. Stony Lake Rd., New Era; SPD; third-degree retail fraud. Pretrial: April 17 at 11:30 a.m. Bail: $2,500/cash/surety/10 percent. – Travis James McMann, 19, of 403 Lincoln St., Hart; SPD; third-degree retail fraud. Pretrial: April 17 at 11 a.m. Bail: $2,500/personal. – Morgan James Pearson, 20, of 160 S. East St., Walkerville; OCSO; second-offense DWLS. Pretrial: April 26 at 3 p.m. Bail: $2,500/cash/surety/10 percent. – Casey Edward Wilcox, 42, of 2499 Sycamore St., Twin Lake; Michigan State Police (MSP); operating without insurance. Pretrial: April 26 at 2:30 p.m. Bail: $1,500/personal. – Raymond Dudley Scharf, 49, of 1870 E. Zimmer Rd., Shelby; MSP; domestic violence. Pretrial: April 10 at 1:45 p.m. Bail: $2,500/cash/surety/10 percent.